We are required to capture a customer’s full face when taking a picture for a driver license or non-driver ID card; therefore we need to be able to see from the top of your forehead to the bottom of your chin. If you have a medical or religious need to wear a head covering in your photo, please advise the MVC staff at the agency camera station. Note: Prior to issuing any document, the Motor Vehicle Commission will use the Systematic Alien Verification for Entitlements (SAVE) system to verify the immigration status of all non-citizens who apply for or renew a driver’s license or non-driver ID at an agency. If legal immigration status cannot be confirmed, the document will not be issued. You must also provide proof by the U.S. Immigration and Naturalization Service, authorizing your presence in the country. In order the obtain the permit, you will need to bring your foreign license and present the documents required to pass the 6 Point ID requirements. You must also provide proof by the U.S. Immigration and Naturalization Service, authorizing your presence in the country and confirming validity of your foreign license. If you cannot show proof of driving experience you will be subject to the GDL Program requirements. After you get the permit, visit any Driver Testing Center to take a vision test, knowledge test and possibly a road test if required. 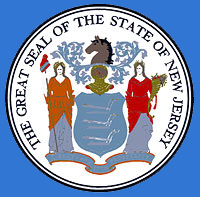 You are not required to surrender your foreign license when MVC issues your New Jersey driver license.